We woke up to a very early telephone call with the news that my sister (who is 30 weeks pregnant) was on the way to hospital as her waters had broken. As you can imagine – we’ve been thinking about her all the day and wondering if she was going into early labour. Thankfully – everything is okay and she now has to stay in hospital and rest for 4 weeks to try and give her unborn bub as much time inside as she can. Of course that has thrown her whole household into chaos (she has 2 boys – Brendan 6 years & Aaron 18 months). I’m not sure she even knows what to start organising! As my sister is in Melbourne – I have quickly assembled a parcel of goodies to send to her tomorrow express post to help alleviate any boredom and hopefully make time go a little bit quicker! A good novel, crossword/puzzle book, notebook and pen, as well as some small needlework projects for her to work on while stuck in hospital. I also made a little card to send with her, just to let her know we are thinking of her. Note: Use a piercing tool to add interest to the card. I have also inked the edges of the white square with the birdie stamp with Apricot Appeal. 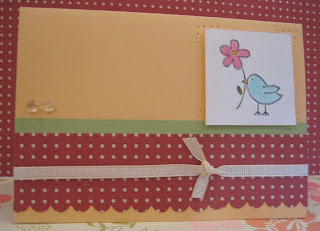 Use glue dots to hold the ribbon in place! I have discovered these gorgeous little embellishments called Dew Drops (and before you ask – no they are not from Stampin’ Up!). They come in the cutest little jars and a huge variety of colours. I found them at the’ little online card shop’. Click on the link to see for yourself. Unfortunately Stampin’ Up! don’t have anything similar in their range at the moment.